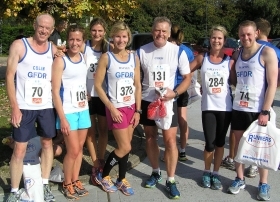 We have around 90 members and welcome runners of all abilities, from new starters to county champions. We hold regular coached training session tailored to mixed abilities and compete in numerous road races,cross country and trail events . Additionally, we compete in the Mid Essex Cross Country League over the winter months. We run a marathon training programme to coincide with the London marathon and also host three local road races, the Tilty Hilly 5 miles,theFelsted 10K and the Stebbing Remembrance Day 10 miles. We have an extensive social programme and work hard to raise funds for local charities.